Cooking recipe, from the culinary tradition of the Italian regions. 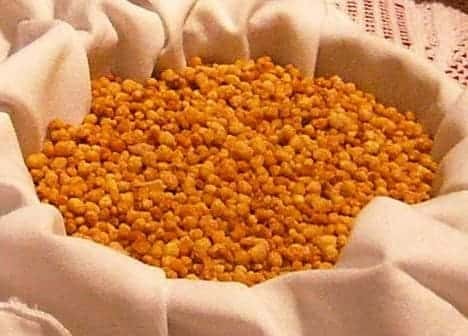 To prepare the fregula traditionally uses scivedda, a terracotta bowl with a flat bottom. In any case, equip yourself with a dish large enough scale and with raised edges and arrange corolla semolina. In a bowl, beat the egg yolks with the saffron dissolved in 3 spoonfuls of warm water, add a pinch of salt, stir and pour 1 spoonful of this sauce in the center of the plate with the flour placed along the edges. Move the tips of the fingers in a rotary direction and pour a little semolina, moisten it and form lumps of the size of a peppercorn. Let them then pass through a sieve with a large mesh and arrange them on a clean kitchen towel. Repeat until all the mixture to work, finally you have the fregula in a tray covered with a cloth and let it dry. When it is dry, cook it in broth and season it with grated pecorino cheese, or serve it with tomato sauce and basil or with seafood. Select a category to get a list limited to the corresponding cooking recipes. Do you know this recipe for Sardinian cuisine? Contribute to this project too! Publish your images of "Fregola (Basic recipe)".